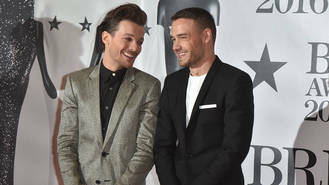 One Direction stars Louis Tomlinson and Liam Payne had a mini-reunion on the Brit Awards red carpet on Wednesday night (24Feb16). The British boy band kicked off an indefinite hiatus just before Christmas (15), but pals Louis and Liam thrilled fans when they teamed up at the annual awards ceremony at London's O2 Arena. The boys looked thrilled to be back in each other's company as they posed together on the red carpet, and Louis, 24, was quick to post a selfie of the reunion on Instagram. "Tommo and Payno... Brits GB," he wrote alongside the snap, which showed him holding a can of energy drink Red Bull while Liam smiled over his shoulder. While One Direction are taking a well earned break, the group is still up for two awards at the ceremony - British Group and British Artist Video of the Year for Drag Me Down. However, only half the band will be at the Brits to accept the award if it wins, as Harry Styles and Niall Horan chose not to attend the event. "This could have been one last hurrah for the boys at what could be their last Brit Awards as a band," a source told British newspaper The Sun, "but Harry has shown no interest in attending and Niall is away on his holidays in Thailand. Louis and Liam want to be there as a thank you for all the fans voting for them in the Best Video category - which is the big audience vote of the night." Louis' attendance marks the first time he has returned to his home country since becoming a dad for the first time to son Freddie on 21 January (16). The little lad was born in Los Angeles.